Outdoor cooking, dining, and entertaining are becoming more popular every year. In fact, Americans spent eight percent more on outdoor cooking appliances this year than last year. Cooking out on the grill is great, but the trend of complete outdoor kitchens has been gaining momentum steadily as people have an increased desire for unique “leisure living” spaces in their homes. It’s easy to see why outdoor living areas are attractive to homeowners. 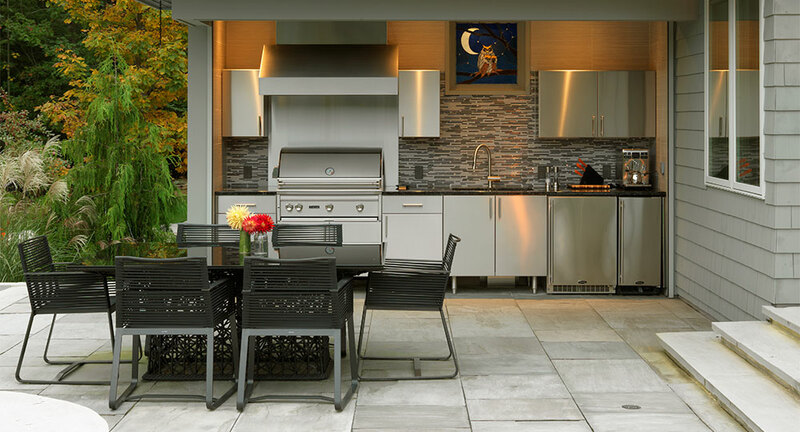 With the ever-expanding range of options for materials, finishes and appliances, outdoor kitchens offer a unique opportunity to truly personalize a space specifically for spending time with family and friends. The materials you select for constructing your outdoor kitchen should be chosen for their quality, flexibility, and low-maintenance characteristics. Your outdoor kitchen will be exposed to the elements, so durability is an important factor to consider. You will also want to make sure your new “outdoor room” fits in with the existing architecture and landscaping of your house. One of the most highly recommended paving materials for outdoor kitchens is sealed stone. Natural stone pavers can give your kitchen a look that’s both elegant and natural. Consider choosing stone that occurs elsewhere in your landscaping so that you can create a cohesive, integrated backyard. Concrete pavers are also a good option. They can be colored and imprinted for a wide range of looks. In a cold climate a base additive can be used to help the concrete avoid cracking during the freeze-thaw cycle. 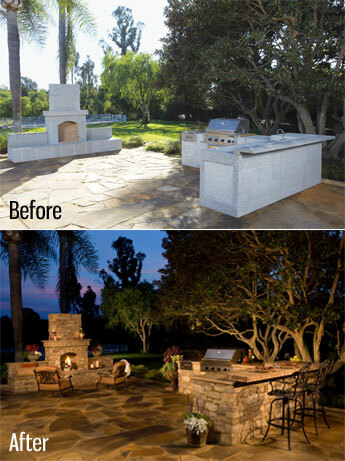 Building an outdoor kitchen has never been easier. With the emergence of modular prefabricated countertop units, you can significantly cut build time and costs while still dressing them in your favorite natural or manufactured thin veneer. These units also allow for sink, grill and refrigerator cut outs so you can enjoy all of the amenities of your indoor kitchen. Your stone outdoor kitchen may not have four walls, but the structural elements are just as important as in any other room of your house. Consider creative additions such as low stone walls that will define the area while serving as additional seating. When you’re deciding what kind of appliances to plan for, keep in mind both your own cooking style and current trends. Many people are incorporating built-in pizza ovens, wood-fired ovens or fireplaces to their outdoor kitchens, adding something truly different to their repertoire. Cooking outdoors offers endless chances for adding spectacular food prep methods like open flames and smoking, so don’t pass up the opportunity. Outdoor kitchens should have the same sort of flow as indoor kitchens to make cooking as efficient as possible. When you are planning, be sure to allocate the right spaces for prepping, storage, and appliances.